Why talk about compound interest? Compound interest is the super power that expands your savings - or makes a mountain of debt. The earlier you understand compound interest, the earlier you can start making the most of it! Scientist Albert Einstein is reported to have called compound interest “the eighth wonder of the world”, saying “he who understands it, earns it...he who doesn’t...pays it”. Compound interest is the money paid on interest you have already earned or paid. It’s a simple idea, with very powerful effects. Here’s how it works. Stash some money in savings, and you’ll earn interest. Then the next year, you earn interest on your original savings, plus interest on the interest you earned in the first year. In the third year, you earn interest on your original savings, plus interest on the interest earned in the first two years. The difference starts out small but really grows over time, as year after year, your interest payments get larger. Like a snowball rolling down hill, your interest payments get bigger and bigger, and your balance grows faster and faster. Compound interest is great for savers, because you get paid interest on any interest you have already earned. But compound interest is bad news for borrowers. Borrowers end up paying interest on top of interest that has already been charged on their loan. Over time, the interest payments and the debt get bigger and bigger. Normally, the quicker you can pay off your debt, the less interest you will pay. Compound interest is the reason why paying small amounts into a pension can add up to a big sum by the time you want to stop working and retire. Compound interest is also the reason why borrowing money at high interest rates, or for a long time, can be very expensive. If you can earn 7% interest a year, your money will double every decade! You can use what’s called the ‘rule of 72’ to find out how long it will take your money to tot up to twice as much, at different interest rates. 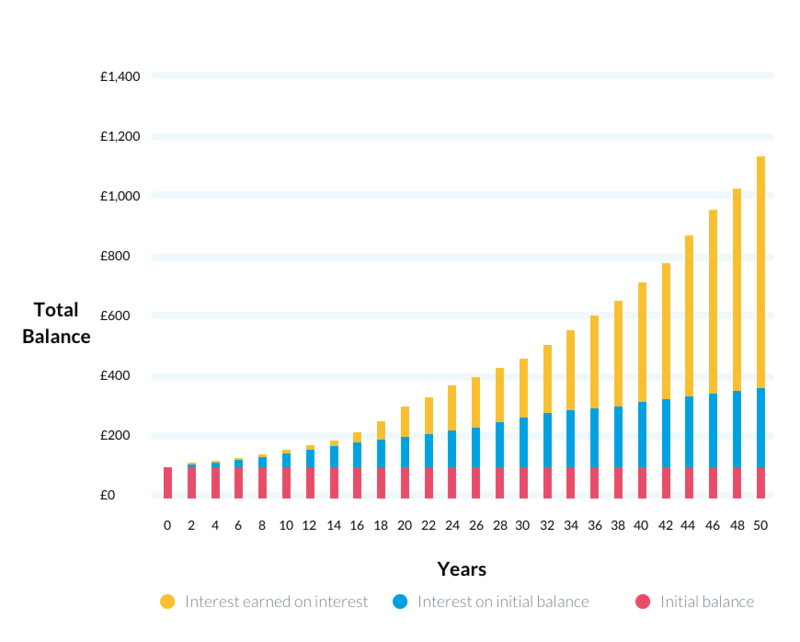 So if you only earn for example 5% interest a year, it will take 72 divided by 5 to double your money: just over 14 years. Earn more interest, at say 10% a year, and it will only take 72 divided by 10, which is 7.2 years, to double your money. This graph, which is based on a 5% interest rate, illustrates just how much compound interest can really add up over time. Explain the rule of 72, mentioned in the ‘Fun Factoid’ above. Get your kids to work out how long it will take their money to double, if they earn different interest rates. Talk to your kids about how banks pay savers interest for letting the bank use their money and charge borrowers interest for letting them borrow money from the bank. Then ask which interest rate is bigger: the interest paid to savers or charged to borrowers? If kids understand how banks make money, they’re more likely to earn interest, rather than paying it, in future. Ask if your child would rather be given £1,000 a day for 30 days, or start with a penny, and double it every day for 30 days. Which one would leave them with more money? Work it out at 10 day intervals, then ask if they want to change their mind! Give a young child a marshmallow (or any other sweet treat!). Challenge your child not to eat the marshmallow right now, but to wait for 10 minutes. If they resist, and still have the marshmallow when time’s up, give them another marshmallow. If they don’t eat either for another 10 minutes, add another two. If they can delay their gratification, they’ll end up with four marshmallows after 20 minutes. Explain this is how compound interest works on savings. If they can leave their money unused, they get the reward of making more money, just as their marshmallows added up! Check out a compound interest calculator online, like this one. Suggest your child saves for example £100 every year starting at their current age, until they reach retirement age at 67,and pick an interest rate of say 5%. Then suggest they put in £100 every year starting at your age, until reaching 67. Clock the difference if you start early. Get a couple of big bags of pennies from the bank, and add a chessboard. Ask your child to put 1p on the first square, double it to 2p on the second square, double again to 4p on the third square, and so on. Ask them to estimate how many pennies they will have used by the time they reach the end of the first line on the board, or how many squares they’ll cover before then pennies run out.